Hamda and Gwen Dickens. Photo by Re:Act Media. Gwen Dickens started working at St. Mary’s Home about 36 years ago, following in her sister’s footsteps. Her colleagues say Dickens, who has studied early childhood development, is a great team leader who loves children and has a sweet nature that brightens everyone’s day – and that she often goes beyond the call of duty. After working mostly night shifts, Dickens switched to the 7 a.m.-3 p.m. shift about three years ago. That’s when she was assigned to Hamda’s room. Hamda didn’t smile much, and Dickens made it her mission, in addition to her regular duties, to make Hamda happy. 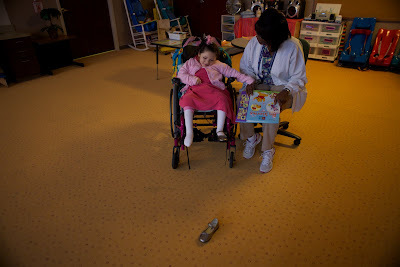 The two have grown extremely close as they’ve established a daily routine centered around talks, walks throughout St. Mary’s 88,000-square-foot building and story time, with Dickens reading books that Hamda chooses. Hamda now smiles a lot as a way to express herself, especially when Dickens is around. Dickens also is Hamda’s constant companion during field trips into the community, such as excursions to the library or shops. “This is a special place and when you see a child’s accomplishment, it does your heart good to know that you have contributed in some small way to foster that accomplishment,” said Dickens, 55, of Norfolk. 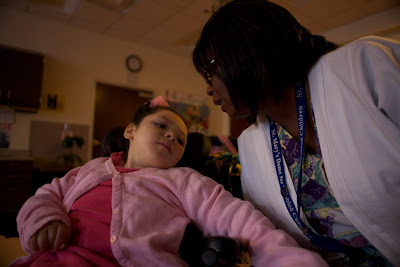 This entry was posted in CNA, Gwen Dickens, Hamda, nurses week by marcomm. Bookmark the permalink.